This is not to say that we were sitting around watching Nick Jr and bumming at the beach. (Not that there’s anything wrong with that.) Without even realizing it, we began checking things off the List of Things We’ve Been Meaning to Do All Year. Monday: We finally saw that documentary First Position about the Grand Prix ballet competition and the girls loved it. Tuesday: We hit Shake Shack. (It’s hard to even admit this to myself as a parent, but my poor, deprived daughters had to live eight and ten years respectively before ever sinking their teeth into a Shack Burger.) We roadtripped to Ikea in search of a “swivel stool” for Abby’s new desk and wound up stuffed to the gills with Swedish meatballs and mashed potatoes. (You know, one of those nice light summer meals.) We visited a new Asian Supermarket across town which everyone keeps talking about and where we found all sorts of cool and crazy little things to try like quail eggs, mochi, and Korean melon. It was there, in the glisteningly clean seafood aisle where I spied a five-dollar cooked lobster ($5!) and remembered one other thing on the List: Make Lobster Roll! 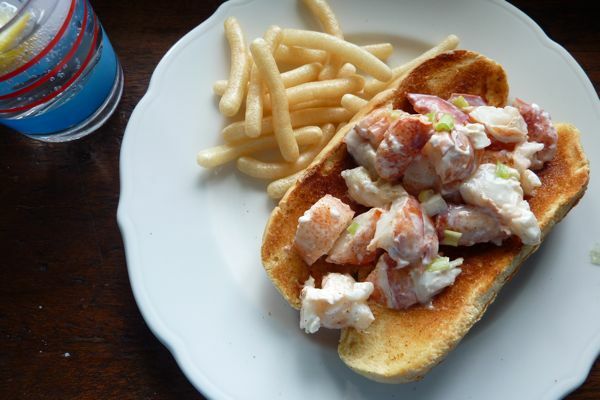 I came home from that trip, tossed the lobster meat with mayo, scallions, and the slightest sprinkling of paprika, and with one bite, officially initiated summer. Makes one lobster roll. Recipe can be multiplied accordingly. Add all ingredients (except bun and butter) in a mixing bowl. Fold together gently. Toast hot dog bun then spread with a thin layer of butter. Top with lobster salad. Don’t forget about the Mega Giveaway: Tell me your favorite part of the book (not on the comment field of this post, but through the official contest survey) and be eligible to win some pretty awesome prizes. You have until July 9 to enter so get reading! PS: A GIVEAWAY! 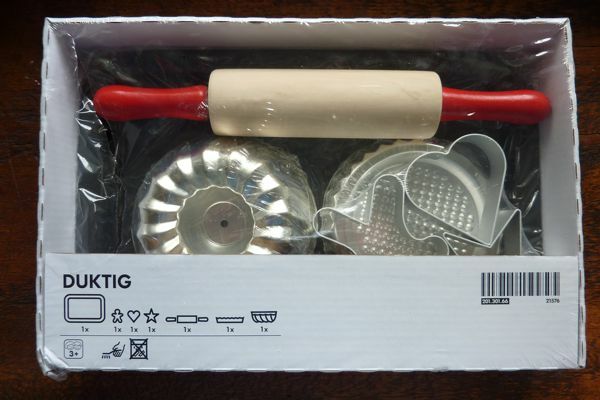 When the kids were on the 3- and 4- and 5-year-old birthday circuit, I used to pick up these Ikea Duktig play baking kits by the half dozen to give as gifts. They only cost $9.99 and stack up beautifully in the proverbial gift closet. I got all nostalgic remembering this strategy so picked one up even though we are, for the most part, past the play kitchen stage. So who to give it to, that is the question! What do you think of this: How about I send it to the person who sends out the best tweet that tags dinnerlovestory? It can be related to anything — the blog, a recipe, July 4th, summer, my book (which by the way, was named #1 cookbook on Amazon’s Best Books of the Year So Far?) Literally anything! I’ll pick a winner before July 4th. Good luck! Thanks for playing everyone. Kerry G. is the winner. Congratulations on the Amazon #1 ranking! I love the book and am rooting for it to be a huge success; looks like you’re well on your way 🙂 Now, to get my hands on some cooked lobster . . .
Well, after my Google Reader reminding me with the delicious picture of a lobster roll, I went and ordered the cookbook for a baby shower. I’m so excited to gift it to my friend! That said… I caved and bought my own copy even though I swore I was waiting until my August birthday. Sigh. Guess I’ll get to go on those word/page hunts for secret recipe planning after all. 😀 Very excited. Got to have the hot buttered roll! Sounds like you guys have been having some idyllic summer days. i’ve finally learned… NO (or very, very few) scheduled activities during the summer. necessary to re-bond, re-group, re-everything. i live near you…where is the new asian supermarket? must.buy.$5.lobster.now!! Your cookbook is AWESOME!! I read the whole thing in a few days and plan on giving it to several friends who are getting married this year. It is the perfect wedding gift. I so enjoyed your casual, fun writing style. I’m only a few years into married life and I plan on implementing lots of your dinner tips starting the 4th of July! I’ve signed up to make salmon salad for my family dinner. 🙂 Loved it all! Thank you! Your summer with kids sounds much like mine. We call ours’ Camp Mom. This week we took tennis lessons every morning, had neighbor kids over to play nearly every day, played lacrosse, made sushi for the first time, ate Korean for the first time. Not too Kumbaya, however. I am counting the days until sleepaway camp. Love, love, love the link to First Position. Even the trailers are perfect for bridging those awkward rainy-Sunday-moments with a ballet-mad 7-year-old.